There are two types of people in this world. There are those that when food is scarce, put on their boots and walk to the store in the ice. And then there are those that get creative and make do with what they’ve got in the kitchen. I am the latter of the two; my husband is the former. Case in point: when I woke up Friday morning to winter storm Cleon and a forecast below freezing through Sunday, I knew I’d be settling in for the long haul. My husband, on the other hand, wanted breakfast tacos. While he headed out into the icepocolypse, I went straight to the kitchen to figure out what the heck we were going to eat. It’s funny, sometimes it’s the meals where you’re short on ingredients or have to substitute with what you have on hand, when you discover the most delicious combinations. Place a large soup pot over medium heat and and add a little (about 1/2 cup) of the broth. Once heated through, add diced chicken and cook until opaque. 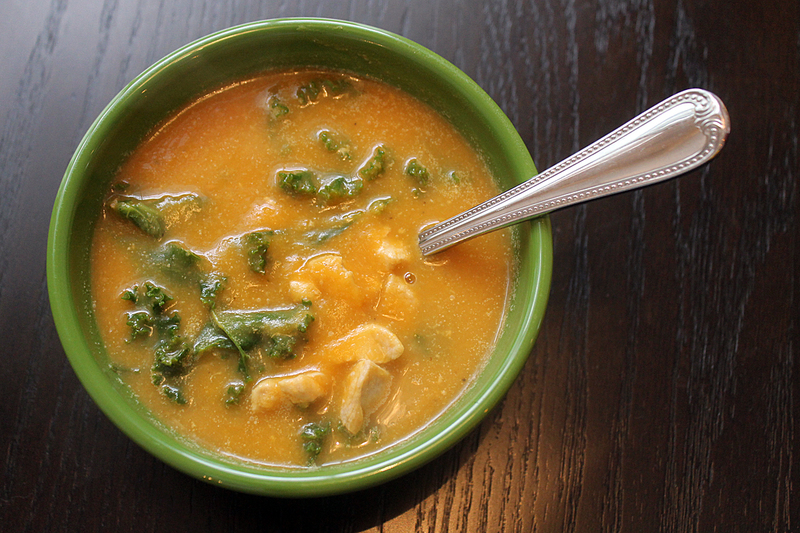 When done, transfer chicken and broth to a bowl and set aside. Return pot to medium heat and add oil. Then add onion and cook 2-3 minutes. Next add garlic and ginger. Continue to cook, stirring frequently, 2-3 minutes. 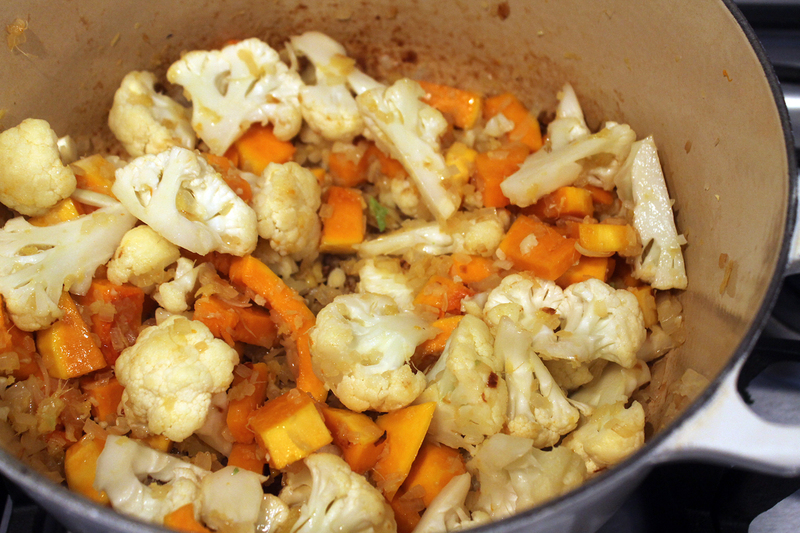 Add squash and cauliflower to the pot and stir to coat with oil and aromatic mixture. Cook 5-7 minutes, then add broth. 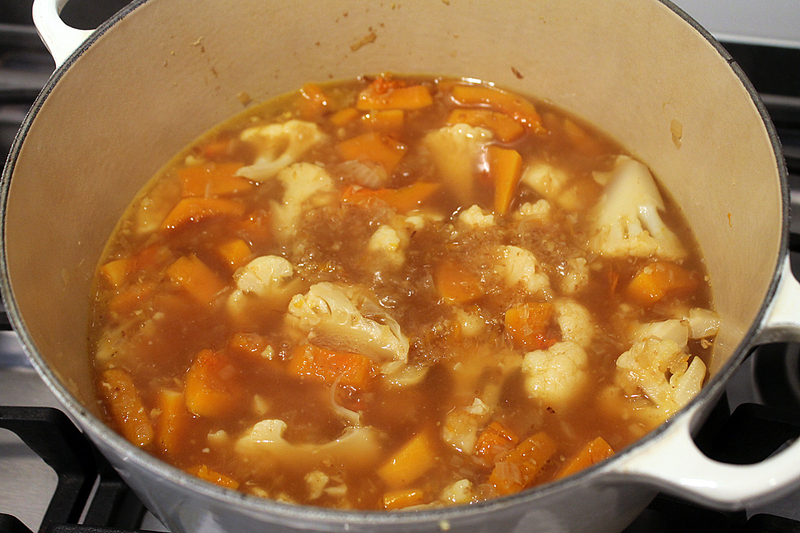 Bring to a boil and then simmer, covered 15-20 or until vegetables are tender enough to be pierced with a fork. To blend the soup, you can use either a blender or an immersion blender. If using a blender, be careful handling the hot soup. Make sure the lid is secure – you may want to hold a towel over the lid just in case (you don’t want hot liquid flying in your face!). 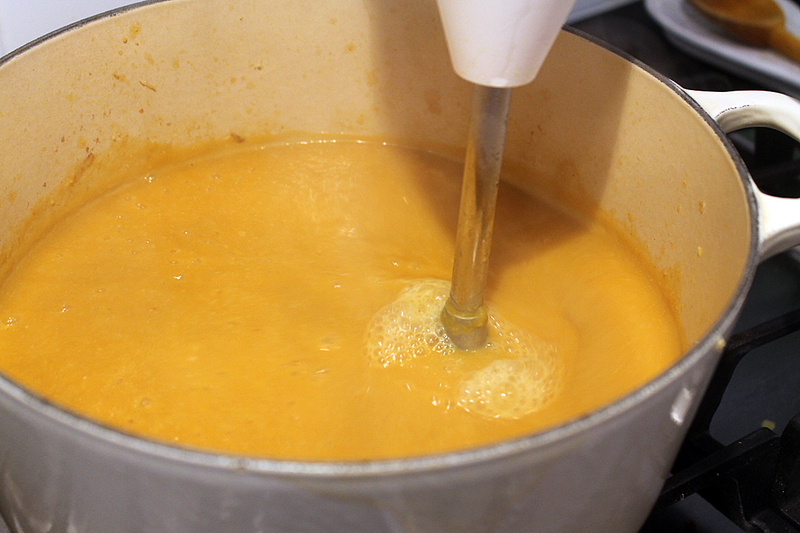 With an immersion blender you can blend the soup directly in the pot. Blend until silky and smooth. Add chicken and extra broth back to the pot along with kale. 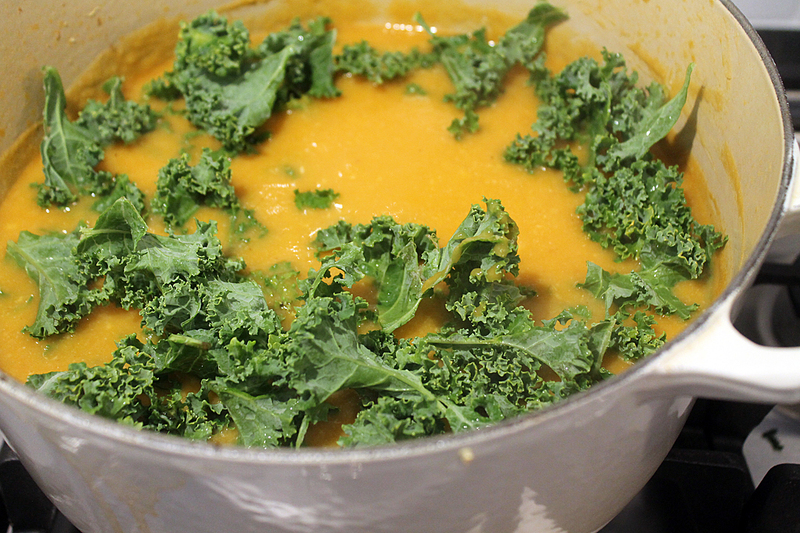 Return the soup to a low boil and allow the kale to wilt into the soup. Season with salt and pepper and serve. I’m all about using what’s available too. 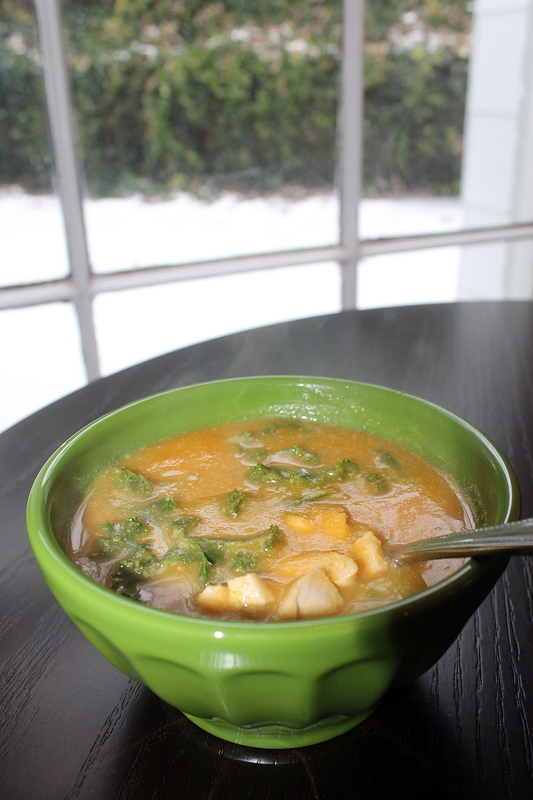 It’s great that this soup turned into such a triumph! No doubt Ross was delighted on his return to smell and have that delicious soup. Good thinking Meg. It looks like we’ll be getting our first storm early tomorrow, ugh! Enjoy the rest of weekend, stay warm.